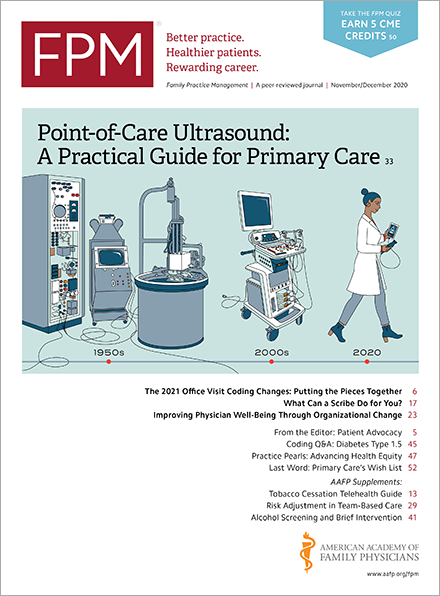 The vast majority of clinicians who were eligible for and participated in the Merit-based Incentive Payment System in 2017 will avoid a negative payment adjustment to their Medicare claims during the 2019 payment year. Physicians eligible for the Merit-based Incentive Payment System in 2018 have only a few more weeks to report your quality measures. The Centers for Medicare & Medicaid Services says it is working to fix errors in how this year's MIPS payment adjustments were applied to some physicians. Screening for cervical cancer is often included in the physical exam portion of a preventive medicine service. Follow this advice to see when you can bill separately for a Pap smear. The relative value of office-based E/M codes is being reviewed. To help inform that review, family physicians can take this one critical step. Here's what to do with that Medicare comparative billing report you may have received analyzing how you bill family medicine office visits. The Centers for Medicare & Medicaid Services is advising physician practices on how to avoid billing errors for two common diagnostic tests. Physicians and their coding staff need to be aware of a change in how United Healthcare approaches and pays claims with problematic documentation. Family physicians are often asked to preform pre-surgical evaluations for patients undergoing procedures. This requires selecting the correct codes. The Centers for Medicare and Medicaid Services finalized its much anticipated Final Rule for the 2019 Physician Fee Schedule, which includes simplifications to E/M coding and documentation but delays other major changes.